A large pier at a busy oil terminal in the Caribbean was struck by a tanker, causing severe damage to the structure. Three months later, the situation worsened when Hurricane Isaac blew through and caused the entire pier to sink around 6 feet below water level causing financial loss and danger to passing ships. Bahama Industrial Technologies (BIT) was approached by Bahamas Oil Refining Company International Limited (BORCO) to act as general contractor for the job. 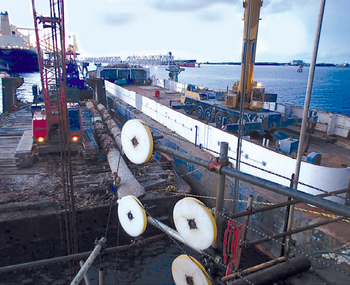 BIT began searching for a company that had the equipment and expertise to cut underwater and remove the sunken damaged sections of the pier deck - and called upon our sister-company ABC Concrete Cutting. The submerged pier was unstable and the bottom sat approximately 30 feet below the surface of the water. The top of the section would break the surface during low tide and be around 6 feet below surface at high tide. 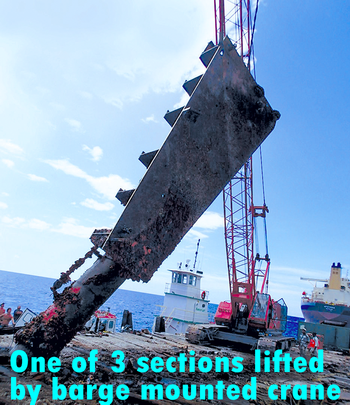 The damaged section being cut consisted of part of the supporting structure along with a 1.5-inch-thick steel decking plate measuring 25 feet by 25 feet. ABC Concrete Cutting planned to deploy a diamond wire saw system to cut the damaged pier sections. The remote-operated saw would allow divers to stay a safe distance from the unstable structure, while mobilization and setup times were much quicker than other methods. The steel decking plate needed to be cut into three sections for a barge-mounted crane to lift it from the water and place it on a work platform for disposal. The plate was connected to six 3-foot-high I-beams, so cuts had to be made through each one to free the sections. From large jobs to smaller jobs, we are your source for solving your sawing, drilling or concrete problems!